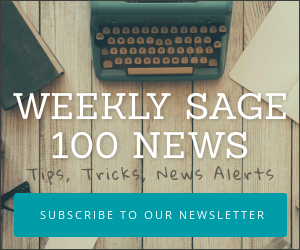 Sage introduced a new community forum in the fourth quarter of 2008, we’ve sensed that the writing was on the wall for their old beloved Sagetalk discussion forum. 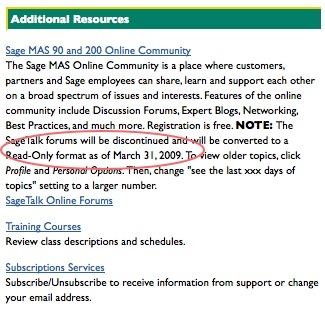 In a posting made to their private online support area, Sage have announced that on March 31, 2009 the Sagetalk discussion forum will be turned to read only status. During this time no new messages or subscribers will be accepted. All the message areas continue to be available (subject to the same awkward password protected restrictions) for an undetermined period of time. If you haven’t been online and participating in the Sagetalk forum for a while, then you might be surprised to learn that Sage have created a new (better) discussion forum based on the Lithium messaging software. You can read new Sage Community messages in RSS feeds through tools like Google Reader. Twitter users can even subscribe to one of the Sage Community Twitter feeds and be notified every time a new message is posted to the community.